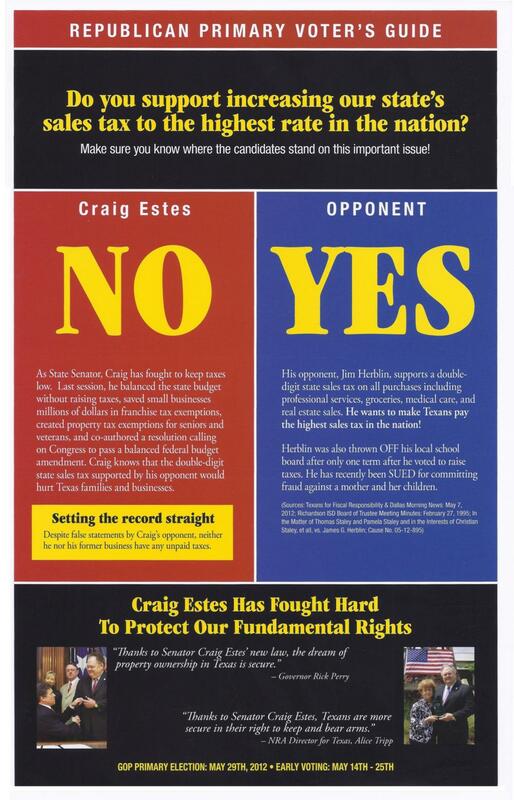 Editorial: DallasNews.com, May 7, 2012 – State Sen. Craig Estes is the better choice for Republicans in the largely rural Senate District 30, which takes in big chunks of Collin and Denton counties before swinging west along the Red River to Estes’ home of Wichita Falls. This newspaper has recommended for and against Estes in past elections, and this time we favor his conventional GOP politics over challenger Jim Herblin of Prosper, who tries to paint Estes as the second coming of Walter Mondale. That’s not working with us. If Estes, 58, has a vulnerability, it’s that he has not developed a strong portfolio of accomplishment or expertise over 11 years in office. Herblin, 53, an accountant, was a member of the Richardson school board who unsuccessfully pushed values and morals issues that critics said were out of bounds for education policy. Running for re-election to Richardson’s nonpartisan school board under the GOP banner, Herblin lost by nearly 2-to-1. Herblin’s vision for state government starts with eliminating the relatively new margins tax on business and maybe eliminating the property tax in favor of a consumption tax. He says there is “plenty to cut” in the budget. Estes’ position is best described as careful, Republican status quo. No Democrat has filed for the office. Either Estes “press release” above in red-bllue is deliberately deceptive by the Estes team, or the Dallas Morning news is wrong – quite a contradiction to post the “press release” and the conflicting DMN article together. From Jim Herblin – ” My position on the property tax is that it should be abolished and concurrently be replaced with a consumption tax. Estes conveniently leaves the abolishment of the property tax out. My purpose in getting rid of property tax is that you really don’t on your property if the government can place a lien on it. Estes must be desperate since he is resorting to lying. A GENUINE “conservative” would support eliminating property tax, so that once a family paid for their home, it could not be confiscated for assorted unpaid taxes. As it is in Texas, we are all just glorified renters and serfs ! I find Estes attempt, above to “SPIN” the issue very deceptive. Voters beware! It appears some campaign consultants — tied to the anti-conservative agenda of Joe Straus’ leadership team — are attempting to deceive Texans in our name. Be advised – Team Estes uses Bryan Eppstein as his consultant – ’nuff said ! If we had term limits then Estes would have been out a long time ago. He has been there too long, he may have been effective and good State Senator at first, but now he is exactly what we are trying to replace. I voted for Jim Herblin…now he may end up not being what he has portrayed himself, I don’t know, but if that is the case then we’ll replace him too.